I've been having this lone bar stool out in the kitchen for a good 7 years now. I remember getting it ... I had taken a load of stuff to Grans to donate and they had put this stoole over by the garbage (as they don't typically accept furniture). So, I left my donations in their window, and loaded the stool into the vehicle .... Brought it home and washed it up. It was in excellent shape, other than the really boring paint. I've thought a bunch of times about doing something with it. A couple times over the last year I'd ask Beau if he'd do a light sand on it for me so I could paint it. But, if he doesn't write it down on his to-do list, things often don't happen. So, I moved the stool out of my way this morning to paint the floorboards (Beau cleaned then yesterday) and found myself muttering about when was he going to get around to sanding this stool. When ... a big lightbulb went on ... uh duh .... like I'm not perfectly capable of sanding it myself .... like just how many years am I going to grumble about this. So, after finishing the BK room floorboards, took the stool out to the garage, sanded and washed it. 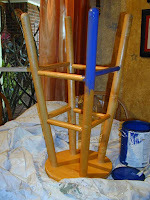 Selected the blue paint and applied two coats. Sat it aside to cure up for a couple days and then I'll proceed with the design.